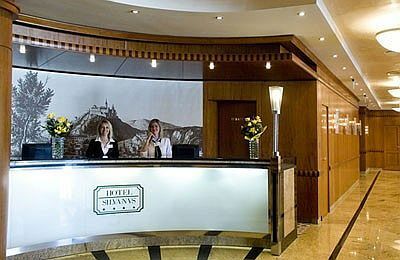 The 4-star Hotel Silvanus is located in Visegrad, in the neighbourhood of the medieval Citadell and the Royal Palace. The wellness hotel, built on the 352 m high Fekete-hegy (Black Hill) offers its guests unique calmness and peaceful and refreshing holiday. Hotel Silvanus, located only 40 kms from Budapest can be easily reached by car or bus on the main road nr. 11. Car and passenger ferries depart every day on schedule, every hour from the ferry terminal in Nagymaros, a sightseeing cruise Visegrad - Esztergom is the ideal choice for the romantic ones. The Mahart passenger ship station is opened both for scheduled and special cruises. The elegant, well equipped rooms of Hotel Silvanus offer familiar, heart-to-heart atmosphere at four stars niveau. Every room of the wellness hotel has own balcony with a sight of the surrounding forests, the Citadel and the Danube Bend. Hotel Silvanus has specially designed rooms for the requirements and comfort of handicapped people and rooms for smoking and non-smoking guests. For families with young children connecting rooms are available. Standard room with forest or Danube view, Superior room with forest or Danube view, Standard suite with forest or Danube view and Deluxe suite. Every room is equipped with telephone, minibar, TV, wireless internet (WiFi), bathrobe and hair dryer. Every room has an own balcony. The superior rooms are air-conditioned and room safe is available. The guests of the luxury suites can enjoy special services included. Small pets are welcome in Hotel Silvanus. The fine kitchen of Panorama Restaurant gained the award of the La Confrérie de la Chaîne des Rôtisseurs international gastronomic society. The non-smoking restaurant has a capacity of 160 people and - connected to the terrace - can seat 210 persons. The restaurant, thanks to its large glass walls, offers a breath-taking view of the Danube Bend. Traditional Hungarian dishes, international delicacies and a wide selection of fish- and game specialities are served in Panorama Restaurant. Guests can order a'la carte or menu dishes or can enjoy a variety of the buffet-table, depending on the occupancy of the Hotel Sivanus. Opening hours: 7:00 - 22:00 every day. The Brasserie, located on the first floor of Hotel Silvanus has a capacity of 80 people. From spring to autumn it can be connected to the terrace so it can entertain 160 persons. In summertime the brasserie runs a barbecue-kitchen and provides total recreation: billiard, darts, table tennis, table football and automatic bowling alleys make the clients enjoy their stay. The traditional drink bar in the lobby on the ground floor offers sandwiches, desserts, coffee-specialities, alcoholic and soft drinks. Hotel Silvanus Wellness Hotel, awarded with the title "the wellness hotel of the year 2000 in Hungary" offers the following wellness services: Finnish sauna, infrared sauna, steam-, salt and aroma chambers, swimming pool (27-29°C), experience pool (32-34°C), jacuzzi (34-36°C), resting place and solarium. The outdoor pool with experience elements, opened in 2011 and the children's pool pamper the guests with outstanding panoramic view of the Danube Bend. The tepidarium recalling the atmosphere of the Roman era is the favourite venue of Toga parties. The guests of the beauty parlour can choose among various treatments, facial massage, foot massage, regenerating body and facial treatments, cosmetic treatments and eleven diverse body massages. The Guinot beauty-products, used in the beauty centre of Hotel Silvanus, assure the professional care. For the lovers of active holidays aqua fitness, a fitness room with strengthening and cardio equipment, squash court and nordic-walking trips in the forests are available. The seven, connecting conference and section rooms on the ground floor of Hotel Silvanus Visegrád are the perfect locations of private and company events and family celebrations up to 240 people. The section rooms have a capacity of 25-40 people, the fast and professional catering is provided by the Wintergarden Restaurant, which is bordering the conference rooms. The Blue Hall on the first floor, the Arpad Hall on the second floor and the Beatrix Hall at the basement can serve 120 people; the Piano Hall on the third floor has a capacity of 40 people. Hotel Silvanus offers a wide range of unique and imaginative team building trainings, medieval competitions like archery, the most favoured contemporary games for adults like squad motor, flights with parawing, paintball, laser fight. The team spirit and cohesion can be upgraded at bicycle tours, geo-coaching tours and canoeing trips. Hotel Silvanus offers various cultural and spare time activities. The guest can take part in the medieval Knights tournaments or gather some experience in archery, laser fight, truffle chase (in case of a victorious chase, by demanding the truffle will be part the dinner at the hotel restaurant). In the close neighbourhood of Hotel Silvanus in Visegrad the following spare time activities are available: full extreme canopy, bobsleigh in Visegrad, Wildlife Park, Nagyvillam Ski run. The cities of Esztergom, Szentendre, Pomaz and Budapest are inexhaustible sources of entertaining and cultural events, you get never bored even in case of a longer stay. The surrounding area of the Danube Bend is rich in natural and historical sights: Ram-chasm, the chasm of the steam Veres, Holdvilag chasm (Moonlight chasm), the ruins of the Pauline Monastery in Pilisszentlélek, the caves of Pilis Mountains, Scythian, Celtic and Roman artefacts, Szentendre Open-Air Ethnographic Museum, peak Dobogó-kő, Teleki-Wattay castle in Pomaz, the Citadel of King Matthias Corvinus of Hungary and the Salamon tower, the Royal Palace in Visegrad and the Renaissance well. The room prices include: half board (buffet breakfast and dinner) the use of the swimming pool, the wellness centre and the fitness room, WiFi Internet access and VAT. Local tax: 460.- HUF/ person / night above 18 years. Extra bed: 16 000.- HUF/ person / night. Children between 6-12 years get 50% discount on the price of extra bed and meals. Pets: 3 500.- HUF/ night. Accepted credit cards: Mastercard, Maestro, Eurocard, American Express, Visa. Cancellations are free of charge if made 72 hours before the arrival date. In case of No show and cancellations within 72 hours the price of the first night will be charged, and hotel sends an invoice of the sum to the post address of the guest.The cancellation policy, and the paying policy can be depending on the packages or the period of the reservation.